An Audi A5 collided with three boys who are believed to have been on the pavement at Shepiston Lane in London on Friday night. LONDON POLICE HAVE released CCTV images of a man they wish to speak to in connection with a car crash that killed three teenagers. At least two men are believed to have left the car following the crash. One of the men was detained by members of the public. The CCTV images released are believed to be of another man who had been travelling in the vehicle. The first man (28) was arrested on suspicion of causing death by dangerous driving. He was taken to a west London hospital for treatment and was then taken to a north London police station where he remains in custody. The CCTV images were captured by cameras local to the scene of the incident. Commenting on the investigation, detective sergeant Michael Rapp of the Met’s Serious Collision Investigation Unit asked anyone who had information on the man to come forward. 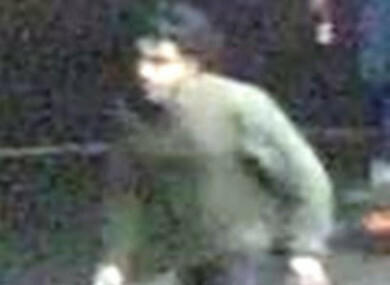 “While the images are not of good quality, I am convinced that anyone who knows this male will recognise him,” he said. “I urge anyone who can identify him or provide details of his whereabouts to contact my team without delay. Three young men have lost their lives as a result of this incident; such tragic circumstances must far outweigh any taboo around assisting police. Anyone in the UK with information should call the Met’s Serious Collision Investigation Unit on 0208 991 9555 or via Twitter @MetCC. Alternatively, they can contact the independent charity Crimestoppers on 0800 555 111, or visit crimestoppers-uk.org. Read: Dear Sirs… How can we take you seriously when you sponsor and attend these events? Email “CCTV released of man wanted for questioning over car crash that killed three teenagers”. Feedback on “CCTV released of man wanted for questioning over car crash that killed three teenagers”.